Abrams, WI (Oct 2, 2012)–TORC Series put an exclamation point on the 2012 season by honoring former Pro-4 champion Rick Huseman and his brother Jeff who were tragically killed in a plane crash on October 16, 2011. The emotional weekend was especially tough on Johnny and Kathy Greaves who were very close friends and Monster Energy/Toyota teammates of Rick and still remain close to his wife Michelle. The weekend’s races were held in Antelope Valley Fairgrounds in Lancaster, California, and consisted of 2 races on Saturday, followed by the Rick and Jeff Huseman Memorial Cup races on Sunday. Antelope Valley is where Rick got his first win and the entire weekend was spent honoring the two fallen members of the off-road racing community. In an ironic twist, Johnny Greaves would end up driving Rick Huseman’s number 36 Monster Energy Toyota. Johnny dropped a valve on his truck in qualifying and was not race ready. The Huseman’s allowed Johnny to use Rick’s truck that had not been in a race for more than a year-and-a-half. Even though Johnny did not race hard and stayed in the back of the pack for the race, it allowed him to salvage valuable points. Greaves would finish the year with yet another top-3 in the standings. It was an emotional experience however to be in the seat of his friend. CJ entered the weekend in a tight points race in his first season behind the wheel of the Monster Energy/Toyota/Maxxis Tire Pro-2 truck. He finished the season 4th, just behind Chad Hord, Rob MacCachren and Bryce Menzies. In the Pro Light class race, CJ started on row 3 beside RJ Anderson. The field consisted on 3 Monster Energy drivers, CJ Greaves, RJ Anderson and Casey Currie. Currie took the early lead with RJ and CJ taking Monster Energy into the top 3 spots. All three racers were pushing hard for the win and had some exciting side-by-side racing. Anderson passed Currie for the lead at the competition caution. Currie had to pull out of the race however with mechanical problems. Anderson and CJ pull away from the field. CJ set up his pass and took the inside line around Anderson for the lead. After a full-course caution due to a late race rollover, CJ was able to hold off the field and take the win and land his 7th Pro Light podium for the year. He also received the Traxxas Max Lap award for the fastest lap time, his 4th of the year. In his first race on Saturday, CJ Greaves started on row 3 next to Rob MacCachren. After a restart and a brief battle with Chad Hord, CJ landed in the 4th spot. He also muscled his way around Oberg, but hooked a rut and dropped a couple of positions. Unfortunately, had a fire in the cockpit and had to jump out of his truck just ahead of the competition caution that ended his race. For the second race on Saturday afternoon, Johnny and the G-team remarkably changed motors during the break and had his #22 Toyota repaired and ready to race. The race was wild and crazy with multiple roll-overs and crashes. Johnny would eventually work his way to the point position up to the competition caution, midway through the race. With only 4 trucks still in the race, Johnny hooked a rut and rolled over on his roof. The track crews quickly got his truck righted and bump-started. He rejoined the race at the rear of the pack. Johnny went back to work and got as high as 2nd before pulling off the track with mechanical issues. He was able to collect another Oakley Bomb award, his 5th of the year. The Pro Lights were up next. CJ again started his #33 Monster Energy/ Toyota/ Oakley/Maxxis Tire Pro Light truck on row 3. He survived the turn 1 mayhem and was riding in 3rd by the end of lap 1. Greaves took the lead from Morris and had his hands full trying to hold off a very aggressive RJ Anderson. Monster Energy again occupied the top 3 spots with CJ on the point. After the competition caution, CJ was able to hold the lead for the next couple of laps, but RJ continued to pound on Greaves and eventually took the lead. The race ended with a first time ever, Monster Energy sweep–RJ Anderson, CJ Greaves and Casey Currie took the top 3 podium spots. CJ quickly left the podium to get ready for his final Pro 2WD race of the year. CJ got off to a good start and was challenging Chad Hord for the 4th position when Rob Mac hit the K-rail, while in the lead, to bring out a full-course caution. During the caution, CJ disappeared from the track with mechanical problems, ending his year with a disappointing finish but all-in-all a very good rookie year for the 16 year old Greaves. He wound up 4th in points and just 15 points behind 3rd place Chad Hord and 48 points behind the leader. 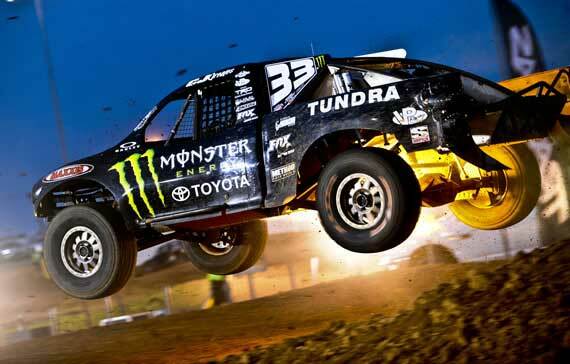 On Sunday, TORC held Traxxas Pro Light Cup race in honor of Jeff Huseman with a $15,000 purse. CJ would not fair very well in the race that had no competition caution. He suffered a flat tire that basically took him out of competition. The Rick Huseman Cup race on Sunday would have a purse of nearly $65,000 and would pit the Pro 4’s against the Pro 2’s! The race honored Rick Huseman, one of off-road racing’s greatest legends. It would have been a great honor to win this race to honor his friend but it was not to be. Greaves won the hole shot for the Pro-4 pack. But after a few laps in the lead, he had to pull off the track with mechanical problems. As the season comes to an end, Greaves Motorsports would like to thank all of our sponsors, fans and friends who support us and cheer for us throughout the year. Thanks to Monster Energy, Toyota and Maxxis Tires for the great sponsorships as well as Amsoil, MasterCraft, Oakley, Fox Shox, Boatec, Method Race Wheels, Kawasaki, VP Racing Fuels, AKA, Baileigh Industrial, Liquid Force and Team Associated for giving us a great season. Abrams, WI (Sept 3, 2012)–Huge crowds turned out for the 43rd running of the World Championship of Off-road Racing at Crandon International Raceway this past Labor Day weekend, a weekend many plan their year around with great anticipation. The weather was outstanding and the packed “Big House” saw some exciting off-road racing as drivers from all over the country took on the fabled 1.5 mile track located in Central Wisconsin. Both Johnny and CJ Greaves entered the weekend coming off huge wins at Bark River and were looking to make a dent in the points standing with 4 points races left in the 2012 TORC season. Friday Johnny proved that when he is “on”, he is virtually untouchable in his Monster Energy/ Toyota/ Maxxis Tire Pro 4×4. The Friday race was a makeup for the June race at Crandon that got rained out. When the green flag flew, Johnny won the holeshot from a rare rolling start at Crandon and never looked back. While the rest of the field played demolition derby, Johnny maintained a sizable lead the entire race with only a late race threat by Ricky Johnson. The back-to-back wins were definitely a confidence builder for the team. The year has been a coming together lesson for the team but it certainly looks like they are jelling. Johnny also grabbed his 3rd Oakley Bomb award. In the Pro-2WD makeup race, CJ was off to a great start with Rob Mac, Oberg and CJ pulling the holeshot. After CJ passed Oberg for second, he stayed with the front runner Rob MacCachren and the two gapped from the rest of the field up to the competition caution. Rob Mac and CJ were clearly the fastest trucks on the track. On the restart, Bryce Menzies tagged CJ in the rear that spun him out, sending him to the back of the field and delivering a black flag to Menzies for the contact. CJ quickly went back to work and made a charge to the front making it up to 5th when disaster struck again. CJ made a smooth, clean pass on Jeff Kincaid for 4th. Kincaid, didn’t like the move so he got into CJ hard in the next turn, tangling the two together. By the time they were able to pull away, CJ found himself at the rear of the pack once again. He worked hard though and was able to get back up to 5th by the end of the race. Rob MacCachren also left the race with a broken truck. The Pro Lights were up first as World Championship weekend continued on Saturday. CJ started from the back row and would slice and dice his #33 Monster Energy/ Toyota/ Oakley/Maxxis Tire Pro Light up to the middle of the field. After the mid-race competition caution, CJ began to experience mechanical issues and babied his way to an 11th place finish. In the Pro-2WD class, CJ would find himself ensnarled with a field of hungry veterans who wanted to show out in front of the Crandon faithful. You might think the young Greaves would be intimidated by the likes of NASCAR’s Robby Gordon; Rob MacCachren, who would end the weekend having reached his 200th win; and others who had a ton to loose and a lot to gain. CJ, sitting in a very tight 3rd place in the standings, also had a chip on his shoulder and needed to finish strong to keep pace in the points. CJ powered his Monster Energy Toyota through the famous Potawatomi turn one, winding up in 6th as the field went through the skybox turns and into the gravel pits. CJ passed Robby Gordon just ahead of the famous Barn turn only to lose it back to him on the back portion of the track. When Scott Taylor’s motor gave-way while he was running in 4th, CJ moved up a spot into 5th where he finished the race. Several trucks were running side-by-side as the field hit the gravel pits turn in the Pro-4 Class. Johnny make a great inside move to take the lead on the first lap. On about lap 3, Johnny spun-out in almost the same spot where he took the lead. He quickly got his Toyota re-fired but dropped back to the 5th position with Ricky Johnson assuming the lead. Johnny rallied his Monster Energy Toyota by eventually passing Scott Douglas for second. White smoke began to appear from Ricky Johnson’s machine and he had to pull into the hot pits just ahead of the competition caution and handing over the lead to Greaves. At the green flag, Cennie and LeDuc crash and get knotted up in turn one. Meanwhile Johnny was checking out to a sizable lead. After a lap, officials decide through a full-course caution to untangle Cennie and LeDuc. When racing resumed, Johnny began to stretch his lead out and ended up winning by a comfortable margin with Douglas and Mark Jenkins rounding out the podium. Johnny took another Oakley Bomb award for the fastest lap, his 3rd of the season. Sunday, Johnny was looking to go 3 for 3, and it looked like he was going to accomplish just that. But, after dominating the first half of the race, he lost a wheel just as the competition caution flag was flying that ended his day prematurely. CJ Greaves flexed some Monster Energy/Toyota/Maxxis Tire muscle in the Pro 2WD class by jumping into the lead following a fast and furious 3-wide battle with Rob Mac and Chad Hord at the exit of the gravel pit turn. Chad Hord was able to pass CJ though on the backside, out-of-sight part of the track. Hord, CJ and Rob Mac stretch their lead with Robby Gordon trailing in 4th up until the competition caution midway through the race. In the second half of the race, Rob MacCachren, hungry for his 200th win, pressured CJ for the 2nd spot and eventually able to pass him in the gravel pit. Hord was still in the lead but Mac was on the attack and would in up taking the lead and the win. CJ landed the 3rd spot on the podium in front of Robby Gordon and Bryce Menzies. CJ quickly got ready for his run in the Pro Light division. CJ stayed bogged down in traffic most of the race, making his way up to 6th. He stayed there until the last lap and was able to move up a position, passing Nick Baumagartner with the finish line in sight. Greaves maintained his 3rd place in the standings in the Pro Light class but dropped one spot in the Pro 2WD to 4th following the weekend’s races. The prestigious $40K AMSOIL Cup race was the final race of the weekend that matches the Pro-2WD’s against the Pro-4×4’s. The Pro-2’s got a 12.5 second head start with CJ Greaves in the Pro-2 and Johnny Greaves in the Pro-4×4. CJ got a bad start and was at the tail end of the Pro2’s through turn 1. But after 3 laps, he was up to 3rd and keeping pace with the leaders. Unfortunately, he hit something on the track that punctured his tire and ending his run. Johnny won the holeshot of the Pro-4’s but hit the fluff in turn 2 and hit the wall, tearing up his front end and knocking Greaves Motorsports out of contention for the AMSOIL Cup. The final weekend of racing will pay tribute to Rick Huseman who passed away in December of last year in a tragic plane crash along with his brother, Jeff. The Rick Huseman Memorial Race will be held at Antelope Valley Fairgrounds in Lancaster, CA, on September 29-30th. The Traxxas PRO Light Cup race will also be on tap for the weekend, and it’s the second year Traxxas has put out a generous $20,000 plus purse for the exploding Division. This year, the Traxxas Cup will be dedicated in the memory of Jeff Huseman. Bark River, MI (August 8, 2012) — Bark River International Raceway has been a place that Johnny Greaves has had a lot of success over the years. It’s no wonder Bark River has become one of Johnny’s favorite tracks. Both Johnny and CJ Greaves took turns ascending to the top of the podium with victories this past weekend as The Off Road Championship (TORC) series held rounds 9 and 10 in the upper peninsula of Michigan. Johnny has flirted with wins all year but has been snake bit. He shook the snakes off and the monkey off of his back in Sunday’s race, driving his Monster Energy/ Toyota/ Maxxis Tire Pro 4×4 to a dominating victory. He also claimed the Oakley Bomb award for the fastest lap time in both the Saturday and Sunday races. Saturday, Johnny was dominating the field with a comfortable lead almost the entire race. He found out there is no such thing as a comfortable lead. Johnny had mechanical issues on the next to the last lap that crippled him. He gave it everything he had but had to settle for a 4th place finish in a heart-breaker. CJ’s win also came on Sunday. He started on the front row and, after a couple of laps of riding in second behind Steve Barlow, the younger Greaves took the lead. He kept a nice lead the rest of the race, holding off a hard charging Rob MacCachren on his tail on the last lap. CJ also landed a 3rd place podium spot in the Pro Light class on Sunday. Saturday, CJ started on the third row for the rolling 2×2 start. He made it through the turn 1 holeshot in 4th place for the 11 lap race. Greaves had his #33 Monster Energy/ Toyota/ Oakley/Maxxis Tire Pro Light running in the top-5 most of the race. He suffered a flat tire late in the race due to contact with Ross Hoek and wound up finishing in the back. He jumped out of his Pro Light and crawled into the Pro 2WD Toyota which started on the back row. In Qualifying on Friday night, CJ only made it one lap because an oil line broke. Following practice Saturday morning, the team noticed the motor was losing oil pressure. Not wanting to take any chances, the team decided to swap motors between practice and the race that day. Incredibly they were able to pull off the change and got CJ to the starting line on time. Because of the motor change, and only one lap of qualifying CJ had to start in the last position. When the green flag flew, CJ began to patiently pick off one position at a time. Many of the drivers were having trouble with the slick track but CJ played it smart and was able to make it up into the top-5 by the competition caution by passing Mike Jenkins just ahead of the waving yellow flag. CJ lost a position on the restart to Scott Taylor. On the white flag lap, Chad Hord’s motor gave out, moving everybody up one spot. CJ battled with the 35 year veteran and made the pass, only to have Taylor take it back. Greaves was able to squeeze out a hard fought top-5 Pro 2WD finish. CJ was up first in the Pro Light as racing resumed on Sunday. Once again CJ would have to work from the back of the field–meaning he would have to pass a lot of trucks and eat a lot of dirt in the process. After making it through the holeshot undamaged, he went to work picking off one spot after another. Several trucks were having tire issues and had to pull out for tire changes. The Maxxis tires were hooking up which gave CJ the opportunity to move up to 5th by the competition caution. CJ battled door to door with Ross Hoek and Keegan Kincaid. Hoek and Kincaid got together causing Kincaid’s wheel to come off taking him out of the race. Hoek also took himself out of the race in the scuffle. Greaves was able to claim the 3rd place spot and his 6th Pro Light podium of the year. 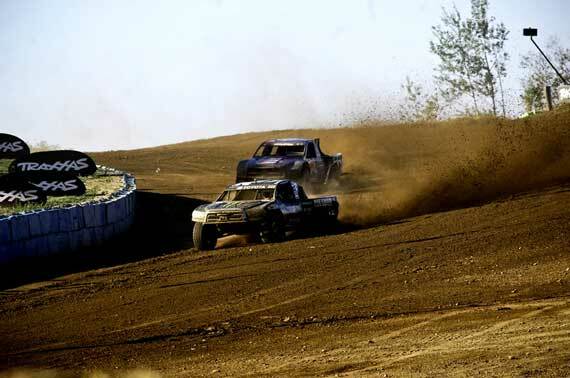 Crandon International Raceway is the next stop on the TORC schedule on the Labor Day weekend, September 1 and 2. Replays of the Bark River races can be seen on XSAN’s USTREAM channel. Chicago, IL (July 21, 2012)–The Off Road Championship (TORC) made a rare Thursday and Friday engagement for rounds 7 and 8 on the dirt at Route 66 in Joliet, Illinois. The Route 66 complex is adjacent to its sister track at Chicagoland Speedway which plays host to NASCAR, IndyCar and ARCA events. The Friday night installment was broadcast live on SPEED TV as well as streamed live over the internet. With nationally know X-Game and Rally Car icon, Travis Pastrana and NASCAR truck series racer Matt Crafton joining the field; it was sure to produce some very competitive racing. Mother Nature was also bearing down on the scene but all races were run with only a slight delay for the Pro Light race on Thursday evening. Johnny and CJ Greaves, excited about the opportunity to show their stuff to the national television audience, geared up for the tight, technical course made of a re-configured oval dirt track. The two nights of racing proved to be an emotional rollercoaster and hard fought experience for the team. Thursday, CJ qualified 2nd and started on row 3 beside fellow Monster Energy sponsored Casey Currie. After a couple of full-course caution restarts, CJ had his Monster Energy/ Toyota/ Oakley/Maxxis Tire Pro Light lined up in the 4th position for a single file start. CJ stayed in the top 5 the entire race but was not able to make any headway on the leaders. He was running 5th, battling with Matt Cook for 4th on the white flag lap. Matt did a hard nose-over on the infield double jump landing him on his side and allowing CJ to take a hard fought 4th place finish. CJ Greaves crawled out of his Pro Light machine and jumped into his Pro 2WD Toyota Tundra to join a field of talented drivers. CJ qualified 2nd. With the 6 truck inversion, he started on row 3 beside Rob Mac. Travis Pastrana was behind him on row 4, the younger Greaves found himself in the middle of a lot of talent that he would have to contend with in order to get to the front. On lap 3, CJ tried to make an inside move on Chad Hord, going for the 4th position at one of the hairpin turns. When he did, his front wheel hit the giant tire barrier hard, spinning him around. Barlow slammed into his rear quarter panel. CJ righted his truck and went back to work. The damage was severe however. Well off the pace, CJ would have to pull out of the race on lap 4: a devastating and disappointing blow to CJ in the points race as well as his hopes for a great showing. Johnny qualified third and started the Pro 4×4 class race on row 2 with Ricky Johnson just behind him on row 3. Scott Douglas won the holeshot but Johnny was right on his back bumper. Johnny, taking the inside line into turn 1, took the lead. On lap 4, Johnny caught a rut. As he checked up, Douglas slammed into his left rear, spinning him 180 degrees, facing the wrong way. Douglas gunned his machine and drove over the front of Johnny’s Monster Energy Toyota. After the mayhem, Johnny emerged in 5th. At the competition caution, RJ pitted to change a tire advancing Johnny to the 4th spot. The contact with Douglas obviously damaged Johnny’s ability to steer his truck. He was able to make his way to third but the damage would eventually take its toll. Johnny ended up in 5th. Friday was rebound day for Greaves Motorsports. With the live SPEED TV broadcast, both CJ and Johnny were anxious to get back on the track and improve on Thursday’s showing. Up first was CJ Greaves in the Pro Light. He started from row 2 for the 2-by-2 rolling start. When the green flag flew, He jumped immediately into the top 3 and up to the second spot before the end of lap 2 before disaster struck. CJ caught the edge of a berm and rolled over on his side in the infield bringing out a full course caution. Track crews put him back on all 4’s and he was able to re-fire his machine. CJ sped around the track to join the rear of the field, still on the lead lap. Greaves went to work on the restart, picking off one position at a time. By the competition caution, he had made his way into the top 4 behind Currie, Caddell, and Morris. With few opportunities to pass, CJ Greaves was finally able to get around Morris to take third in the infield whoop section. On the white flag lap, a full-course caution came out when Norman flipped. The restart would be a green/white checkered situation. Officials sent the field around a couple of times. As bad luck would have it, CJ had a right rear flat. He would not be able to hold off the field at the restart and settled for a disappointing 8th place. Pro 4 hit the track next. Johnny Greaves lined up on the front row and took the lead before the end of lap 1. RJ passed Jenkins to go into second, setting up the classic battle fans have come to enjoy between Johnny and Ricky. Johnny was able to hold off Ricky for a while but RJ would eventually pass him. Johnny held tight to the 2nd position with Douglas trying his best to get around him. Johnny held on to add another podium to the Greaves team’s accomplishments. Thirteen trucks hit the track for the featured Pro2WD class race. CJ was number 13, starting from the very back of the pack with a lot of trucks and talent in front of him to pass. Like a man on a mission, he picked off one position after another: Jenkins, Oberg, Barlow and Pastrana. He was up to 6th by the competition caution with Chad Hord in front of him and next of the list to pass. On the restart, Hord and Kincaid pass Taylor. It was CJ’s turn to pass him. As they exited the turn, CJ powered to the outside of Taylor. But Taylor took the line away from CJ, forcing him off the side of the tabletop and off the track. CJ kept digging and only lost one position. In the mean time, Travis Pastrana rolls bringing out a full course caution. USAC resets the field back to the last green flag lap: Rob Mac, Menzies, Hord, Kincaid, Taylor, CJ and Barlow made up the top 7. CJ quickly got around Taylor clean for 5th, but when Menzies bicycled, Taylor ran hard into CJ allowing Barlow to claim 5th. The track was getting increasingly slick. With about 2 laps to go, CJ over rotated and dropped several positions. He battled with Mike Jenkins. Menzies, Barlow, Kincaid, and Jenkins have problems on the last lap, allowing CJ to finish in the top 5. Greaves Motorsports will head to the long Bark River, Michigan track on August 11-12. Johnny has won many races in Bark River that features a huge jumps and long sweeping turns. Abrams, WI (June 18, 2012)–Johnny and CJ Greaves took their father/son duo to the familiar confines of Crandon International Raceway for a jam packed weekend of racing and an opportunity to make headway in their respective pro-classes: Johnny in the Pro 4×4 and CJ in the Pro 2WD and Pro Light. They immediately made their presence known by qualifying first in the Pro 4 and Pro 2 Monster Energy/ Toyota/ Maxxis Tire machines. With rain in the forecast for Saturday, the team prepared for muddy conditions. Only the Pro Light race however would make it under the weather radar for Saturday. CJ played it smart in the slippery conditions as rain muddied the track with several laps to go. He landed the second place podium spot. Race officials decided to postpone round 5 until a later date due to safety concerns. The skies cleared-up for Sunday’s racing. Johnny was first on the track, starting on the outside end for the traditional “landrush” start next to Ricky Johnson. The field stormed towards the infamous turn 1 with RJ winning the holeshot. Before the gravel pit turn, Johnny muscled his way into second. Johnny was patient though and held the second place spot up to the competition caution and the midway point. On the restart, RJ and Johnny were nose-to-tail all the way around the track. RJ went wide as the two pitched it sideways into the straightaway that lead to turn one. Johnny took advantage and ducked inside of Ricky to take the lead. But Ricky stayed on Greaves and jumped into the back of Johnny’s Toyota off of the Traxxas Launch Zone. RJ went ahead, but Johnny made a smooth inside-outside move to regain the lead at the start/finish line. In the argon turn, both Johnny and RJ spun out on the blue groove. RJ smashed into the left/front wheel of Johnny as he tried to get going again. The collision would damage Johnny’s truck to the point that he almost had to pull out of the race. RJ also suffered damage and had to pull out of the race on the white flag lap. Johnny was able to continue, but just barely. With the wheel pointing almost 90 degrees from the truck, he tried to complete the race. The wheel eventually came off within 100 yards of the finish line. In a valiant effort, Johnny made it to the line to salvage points and finishing 5th in the race, one spot ahead of Ricky. 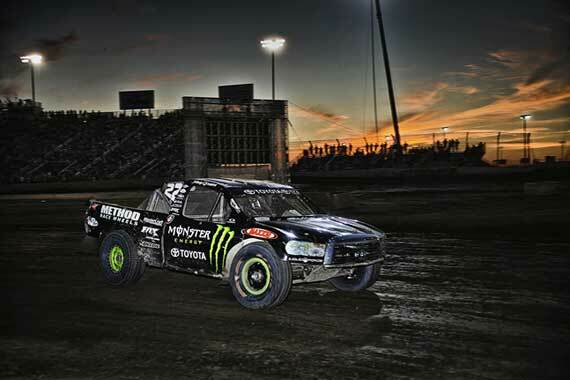 CJ crawled into the Pro-2WD Monster Energy Maxxis Tire Toyota Tundra ready and able to take on the field of veterans. The landrush start, a frightening endeavor for even the most experienced driver, produced another hair-raising start. CJ, starting from the middle of the pack, made it through the holeshot unscathed which was not the case for Steve Barlow and Andy Zipperer. Zipperer took a violent roll, taking out the barrier resulting in more than an hour delay to repair the fence. Officials stacked the trucks up once again for the restart. CJ emerged in 5th place but another crash brought the field to a standstill with a red flag stoppage and lengthy delay. When racing resumed, CJ battled hard into the 4th spot. The dust and slick track made it hard to pass. CJ battled hard to make it to the podium but fell a few feet short. Later in the day, CJ grabbed the wheel of his Monster Energy/ Toyota/ Oakley/Maxxis Tire Pro Light and lined up on the inside end. When the green flag flew, the field of 15 trucks streaked towards turn one. Greaves stayed in the throttle hard as the trucks went 3-wide down the front stretch in front of a huge crowd of Crandon faithful. CJ took the outside line and passed everybody for the lead before they hit the gravel pit turn. Greaves dominated the first half of the race. When the field lined up for the competition caution, officials moved Andrew Caddell to the front. They said that CJ had jumped the start of the race. However, USAC officials are reviewing the restart using video. The Greaves camp is hoping for a reversal. CJ and Caddell went nose-to-tail, pulling away from the rest of the field. CJ almost took Andrew in the argon turn and then again on the final turn but was unable to make the pass. He made it a pair of deuces for the weekend with 2 second place podium finishes. CJ also received the MAX Lap award for the fastest lap of the race. The final race of the weekend was the 19th annual Chairman’s Cup race. This would be the first time Johnny would race against his own son CJ in a battle of the 2 classes. The crew as able to repair the Pro4 truck in order to race for the coveted Chairman’s Cup. The Pro 2WD trucks were given a 12 second headstart on the Pro 4’s for the 10 lap, no competition caution race. Johnny won the Pro 4 holeshot and CJ landed in 4th. However, the handling did not last for Johnny and he pulled out of the race to save the truck for another race. CJ, also out of contention, pulled out of the race. Chicagoland is the next race on the TORC schedule. The race just outside of Chicago in Joliet, IL, will be held on July 19th-20th. Replays of the Crandon races can be seen on XSAN’s USTREAM channel. 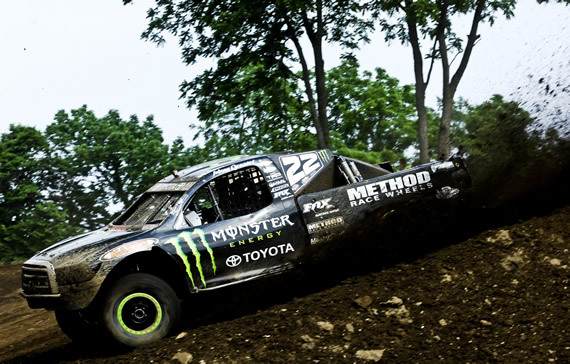 Abrams, WI (May 29, 2012)–Greaves Motorsports headed to Red Bud MX Park in Buchanan, MI, for rounds 3 and 4 of The Off Road Championship (TORC) series this past weekend in hopes of good weather and a good racing outcome for their Monster Energy/Toyota/Maxxis Tire team Greaves duo. They got their wish with Johnny getting his first podium of the year with a 2nd place on Saturday after running up front most of the race. CJ, racing in both the Pro Light and Pro 2WD classes, podiumed in 3 of his 4 races, taking home a 2nd place in Pro Light and 3rd place in Pro 2WD on Saturday. He landed another 2nd place in Pro Light and narrowly missed the podium in Pro 2WD with a hard fought 4th place finish on Sunday. CJ earned the Traxxas MAX Lap, fastest lap award in both of his Pro Light races. CJ was up first on Saturday and started his Monster Energy/ Toyota/ Oakley/Maxxis Tire Pro Light from the 3rd row. He landed in the 5th position as the field sorted out and each truck settled into their spot for the first lap. At the end of lap 3, CJ was working hard to get around the 4th place running Brad Lovell when he caught a rut, bicycled, and rolled onto his side on the front stretch. Since the track was blocked, the track went under a full course caution while the track crews righted CJ’s number 33 Toyota. He refired the truck and hustled around the track to the rear of the field but still on the lead lap. CJ would proceed to make a tremendous comeback, picking off one position after another and was back up to 7th by the competition caution at the halfway point. CJ jumped quickly up to 5th on the restart and moved up to forth courtesy of a roll by the 4th place running Ross Hoek which brought out another full course caution. On the restart, the field was mixing it up on the whoops along the front when Luke Johnson got squirrelly. CJ took advantage of the opportunity and muscled passed the 3rd place truck and Johnson to claim 2nd behind Andrew Caddell. As the laps counted down, CJ tried to get around Caddell but was unable to make the pass and finished his tremendous march from the back to the front in 2nd. The younger Greaves made his way back to the staging area to strap into the Pro 2WD Toyota Tundra in a field comprised of veterans and a handful of young guns. Starting from row 3, CJ would have to wade through a bunch of trucks to get to the front. When the green flag flew, Greaves battled for a good spot while at the same time showing a lot of poise and patience as the field sorted itself out through the holeshot made up of an uphill lefthand sweeper. As they hit the back stretch, CJ was in 5th and right on the tail of the leaders made up of Rob MacCachren, Chad Hord and Jeff Kincaid with Steve Barlow in the top spot. Kincaid pulled out of the race with mechanical problems and CJ mounted an impressive charge around Rob Mac to claim 3rd. At the competition caution, the running order was Hord, Barlow, Rob Mac, and CJ. When the green flag flew once again, Rob Mac went on a tear and passes Barlow and Hord for the lead. CJ was also able to work his way around Barlow on a track where passing was very difficult. With Rob Mac pulling away from the field, CJ worked hard to get around Hord without making a mistake. He finished the race in 3rd for his 2nd podium of the day. Up next was the senior Greaves in the powerful Monster Energy/Toyota/Maxxis Tire Pro 4×4. Johnny started on row 2 beside Ricky Johnson. When the green flag flew, the field roared up the hill, through the lefthand sweeper, and on to the backstretch. Scott Douglas carried too much speed into the jump and went airborne and causing the top running trucks to stack up behind him. Greaves took advantage and shot passed Douglas and Jenkins to take the lead. A rollover brought out a full course caution. Johnny held the lead on the restart followed by Douglas, Johnson and Cennie. As RJ and Cennie exchanged licks, the field began to spread out. Johnny had about a 20 car lead at the mandatory competition caution. RJ had passed Douglas to take 2nd ahead of the caution, setting up a classic battle with Johnny. Johnny Greaves powered his number 22 Monster Energy Tundra ahead to maintain the lead on the restart and through the next several laps. However, coming out of the whoops on the backstretch, Johnny bicycled and almost went over–but he managed to save it, but not before RJ was able to take advantage and go around Greaves. A late full course caution gave Johnny another opportunity to try to claim the top spot, but with only a few places to pass, he had to settle for 2nd and his first podium of the year. Sunday, the team was excited and ready to get back to racing after their strong showing on Saturday. Up first once again was CJ Greaves in the Pro Light class Monster Energy/Oakley/Maxxis Tire Toyota. He started from row 3 and wound up in the 4th spot as he patiently kept himself in position to make a run after the competition caution. When the caution flag lifted, CJ quickly passed Keegan Kincaid and went right to work on the 2nd place running Luke Johnson. CJ passed Johnson on the backside sweeper and headed for Brad Lovell, who had already stretched it out to a sizable lead. CJ made up some ground but ran out of time and took his 2nd Pro Light 2nd place podium for the weekend. CJ made the quick turnaround and got ready for the Pro 2WD race. Starting from row 2 beside Chad Hord, Greaves grabs the 3rd place position which he holds all the way up to the competition caution. With 5 laps to go, CJ, still running in 3rd, had the Rob Mac on his tail and with 3 to go, he bumped CJ back one position and off of the podium. Johnny and RJ would start the Pro 4×4 race from the back row due to an inversion. Johnny and RJ began to patiently work their way in tandem around the tack running in the 5th and 6th spots. At the start of lap 2, Jenkins checked up on the landing side of the front stretch jump. The hard charging Scott Douglas had nowhere to land but on the back of Jenkins. In a chain reaction, Johnny crashed into the rear of Douglas. Jenkins pulled off and as Douglas tried to regain control, Johnny and RJ took advantage and charged forward to move into the 3rd and 4th position with Cenni and Kincaid up front. Unfortunately, the contact with Douglas resulted in the tie rod pushing into the front shot, making it almost impossible to turn. Johnny had to pull out of the race. The Greaves team will head to more familiar territory next as the TORC series heads to Crandon International Raceway on June 16th and 17th. Replays of the Red Bud races can be seen on XSAN’s USTREAM channel. 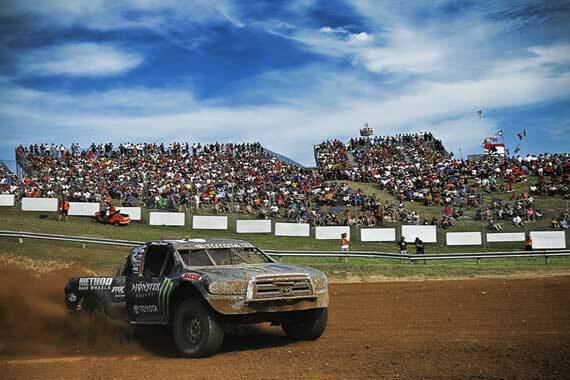 Charlotte, NC (April 23, 2012)–Greaves Motorsports and The Off Road Championship (TORC) kicked-off its 2012 season this past weekend at Charlotte Motor Speedway’s dirt track. The east coast race under the lights aired live on SPEED TV. 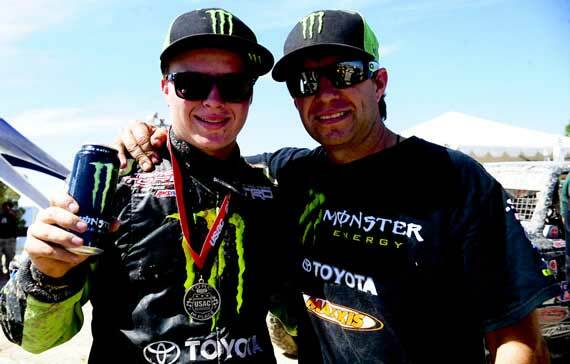 Johnny Greaves has been firmly ensconced in the seat of the powerful Pro 4×4 class for more than a decade, but this past weekend marked the beginning of a new era for the team as CJ Greaves, Johnny’s teenaged son, took the wheel of the Monster Energy/Toyota/Maxxis Tire Pro 2WD class machine for the first time. CJ would also compete in the Pro Light class, hoping to improve on his 6th place finish in the standings last year. Johnny suffered a right rear flat on Friday night due to early contact with Mike Jenkins and Adrian Cenni. The crew made an incredibly fast tire change, only to be held at the entrance to the track by race officials for 10 seconds, putting Johnny a lap down, and out of contention. In spite of the flat tire, he squeezed out a 4th place finish. On Saturday, Johnny’s luck did not improve. He was looking very strong in the first half of the race and was leading at the competition caution. However, a mechanical problem sent him to the pits, unable to finish the race. CJ would have a remarkable opening weekend to say the least. He strapped-in to the Monster Energy/ Toyota/ Oakley/Maxxis Tire Pro Light first, rolling off from the poll position. He battled hard all race in the top 3 positions and made a last lap attempt to pass Brad Lovell for second. CJ was unable to make the pass and settled for a hard fought 3rd place–a podium in his first race of the year! In Saturday’s Pro Light race, the younger Greaves lurked in the top five all race. With the end of the race in sight, he made a last chance charge to gain a podium spot when Brad Lovell rear-ended him, sending him spinning out of control. CJ was able to quickly gather his Toyota but lost his momentum and his chance to move up before the end of the race. He settled for a very respectable 4th place finish. In his Pro 2WD debut, CJ Greaves hoped to get a feel for the truck and learn as much as possible in only his 2nd time in the seat of the 800hp Tundra. He did much better than that. CJ Greaves ended up winning the race–not only his first Pro2WD win but he made history in the process by being the youngest driver to ever win a pro 2 class race… a record that is sure to stand for a long time! CJ pulled a great holeshot, winding up 3rd. While Bryce Menzies, the reigning Pro2WD champ, and veteran Jeff Kincaid battled up front, CJ was being patient as the top 3 stretched their lead from the rest of the field. As the laps wound down to the competition caution, CJ closed the gab between him and Kincaid. On the restart, Kincaid bicycled on one of the infield turns giving CJ the opportunity to advance. He made the pass into second at the entrance to the front stretch. With only 1 1/2 laps remaining in the race, the leader, Bryce Menzies, spun-out moving CJ into the lead and propelling him to his win! An elated CJ jumped on the top of his winning truck just like his dad has done in his many wins over his legendary racing career. In Saturday’s Pro2WD race, CJ worked his way up to 4th at the competition caution after avoiding early collisions in front of him. Bryce Menzies took the lead away from Chad Hord, who dropped to 3rd just ahead of the caution. On lap 13, Oberg goes head-over-heals, bringing out a full course caution. On the restart, Menzies, Hord and Greaves pulled away from the field. CJ worked hard to get around Hord but was unable, but landed his 3rd podium of the opening weekend of racing. The TORC series moves to Red Bud Motocross park located in Buchanan, MI, for rounds 3 and 4 on May 26th and 27th. Replays of the Charlotte races can be seen on xsantv USTREAM channel. Temecula, CA (February 20, 2012)–Greaves fans will be seeing double in the upcoming TORC series season. Johnny Greaves Motorsports announces that Colton “CJ” Greaves will strap into the Pro 2WD Monster Energy Toyota as well as compete in the Pro Light class for the second year. CJ Greaves, the teenage son of Pro 4×4 champion Johnny Greaves, will enter his third year as a professional off-road racer–join a growing number of young guys entering the sport. With back-to-back Super Buggy championships and a very strong showing in his Pro Light debut in 2011 including 5 podiums and topping off the season with his first win in the inaugural Traxxas Pro Light Cup race, CJ Greaves has proven that he has the talent and natural feel for the dirt. He ran up front a lot in the Pro Light class last year and narrowly missed several wins. The more powerful and weight of the Pro 2WD class will be a challenge for the younger Greaves. A new truck is under construction and will be ready to test next month. The team will run all three classes out of the same pit. Johnny Greaves will attempt to extend his legendary professional off-road career to an impressive 10th championship. 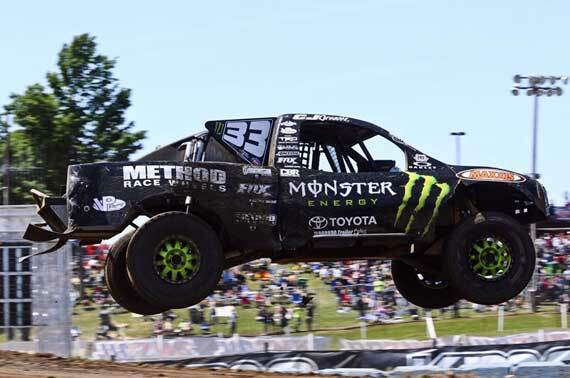 The Monster Energy Toyota/TRD will once again be clad with Maxxis tires. Johnny finished 2nd last year in a closely fought battle with Ricky Johnson. USAC will kick-off The Off Road Championship (TORC) season at Charlotte Motor Speedway on April 20th. Greaves fans can get the latest news, results, race photos, videos and standings on JohnnyGreaves.com and on Facebook (@pro4champ). Also watch live streaming of the races on USAC’s USTREAM channel.